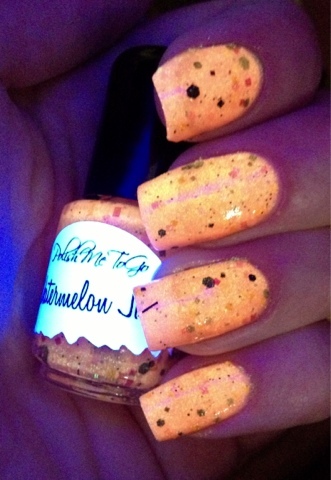 Everyones favorite glow in the dark polish maker, Polish Me To Go, is coming out with a new collection! The collection is inspired by nature. 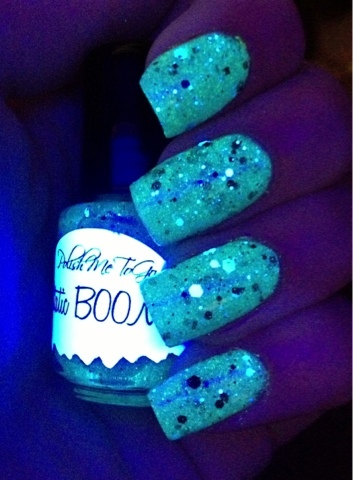 Each polish has both glitter and a glow in the dark effect. I recieved five out of the six polishes in the collection and have some gorgeous swatches as well as some fun nail art. Fuzzy Caterpillar is the first polish I swatched. This is a sheer green base full of teal squares, black hexs, large holo hexs and small white peppered glitters throughout. In the dark this glows a vivid neon green! The formula was great on this. I didn't need to shake it much to get the glow pigment to unsettle and all the different glitter shapes were easy to find and apply. In blacklight Fuzzy Caterpillar glows hulk green. Static Boom is a really beautiful polish. This one did settle but mixed easily when shaken. This grey polish is full of shimmer for the base and filled with black and white glitters of different shapes and sizes. I used three coats and you can still see my nail line slightly so you could use it over another color or do a few more coats to make it opaque. The glow on this one is a brilliant teal. My camera made this glow a little more blue than the true bluish/green it actually is. In blacklight Static Boom has a strong blue reaction. 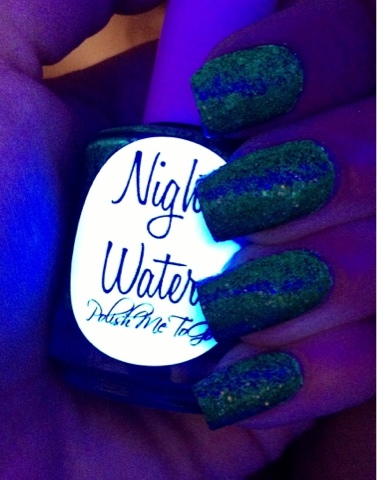 Night Water is a really unique and beautiful polish. 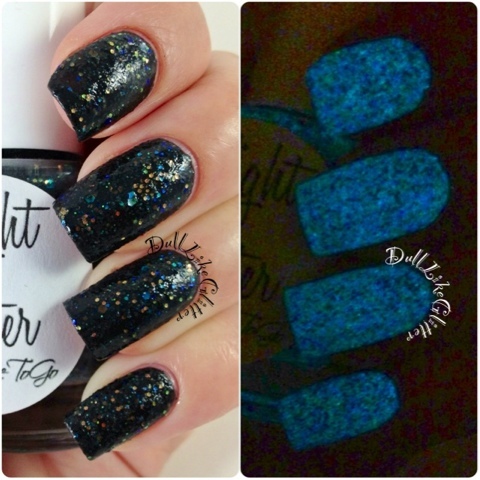 This polish has a black base and is full of different translucent and color shifting subtle glitters. 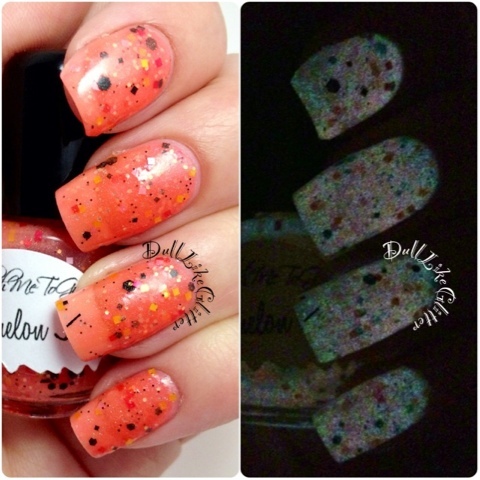 It is really exciting to watch the colors shift and change on the nail. This polish settles quickly so you will need to shake it up well before use. In the dark is where Night Water truly surprises! The black base changes to a bright teal in darkness. 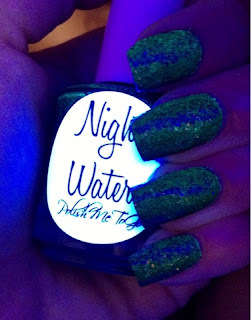 Under blacklight Night Water has a strange reaction and turns a deep almost mossy green. Watermelon Juice is a pretty hot pink base that is full of shimmer. Red, black, yellow, and pink glitters are strewn throughout. This one needed barely any mixing at all! The glow on this polish was so surprising. 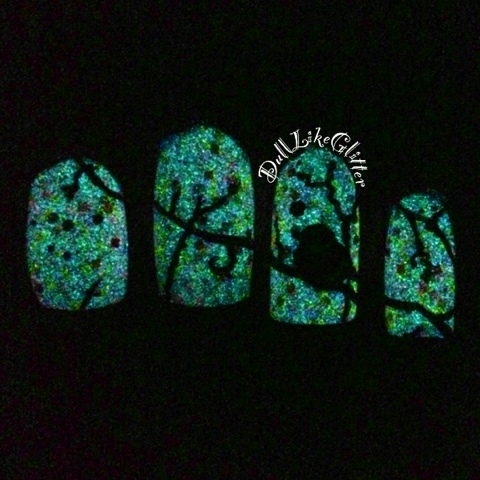 In the dark the nail turned a bright white with pink and blue variations that almost looked like patches of color. It is so unique in its glow, I was quite astounded. I've never seen a glow like this before on polish or elsewhere! Under blacklight Watermelon Juice glows a bright neon peachy-pink. I've saved my favorite for last! Galaxia is a beautiful polish on its own. This one required no mixing! I actually at first thought it wasn't a glow polish because it lacked the settling glow polishes usually have. The base is a purple that is slightly sheer but can be layered for more opacity. I used three thick coats above. 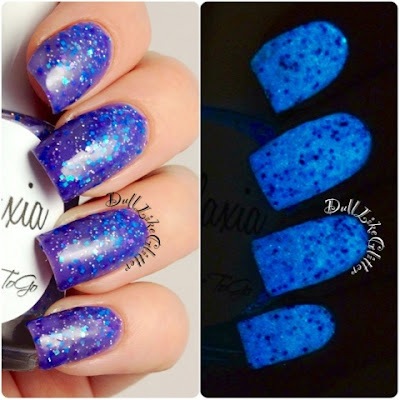 Galaxia is filled with blue, purple and silver glitters that just look so cozy together. In the dark Galaxia is super vibrant. My camera shows this as a blue glow but it is the perfect bright teal. I was gaga for this color in the light and in the dark! Galaxia did not have much of a blacklight reaction but who cares when it's so beautiful in the other settings! I created this bird silhouette mani using two layers of Butter London Kerfuffle as the base and used two coats of Watermelon Juice over that. The silhouette was hand painted. In the dark the glow shows up revealing the silhouette. Overall these polishes all have an amazing glow! I would expect nothing less from Polish Me To Go, she always delivers! My favorites are Galaxia, Night Water, Watermelon Juice and Sonic Boom. 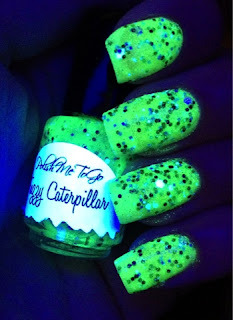 The only reason Fuzzy Caterpillar isn't up there is because I'm not a green girl when it comes to colors. 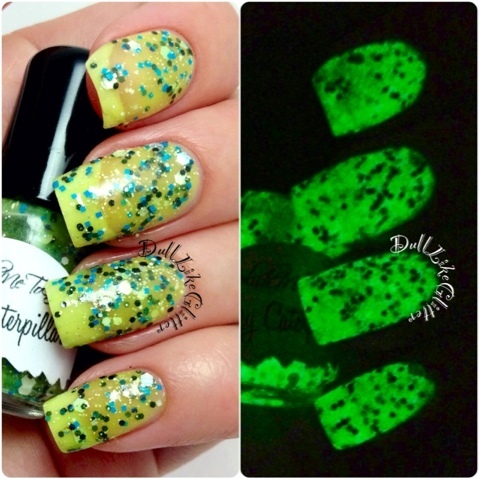 You can't go wrong with any of these polishes if you want a beautiful glow in the dark look. The amazing glows don't even translate in photos. They are so much more amazing in real life! When will these polishes be available? I sent the maker an email but she hasn't replied yet, and I am very curious, lol. Thanks for the great swatches.